Also serving communities of Wenonah, Mullica Hill. There are 12 Assisted Living Facilities in the Sewell area, with 4 in Sewell and 8 nearby. The average cost of assisted living in Sewell is $3,940 per month. This is higher than the national median of $3,346. Cheaper nearby regions include Glassboro with an average starting cost of $3,776. To help you with your search, browse the 109 reviews below for assisted living facilities in Sewell. On average, consumers rate assisted living in Sewell 4.4 out of 5 stars. Better rated regions include Williamstown with an average rating of 5.0 out of 5 stars. Caring.com has helped 6 families in Sewell find high-quality senior care. To speak with one of our Family Advisors about assisted living options and costs in Sewell, call (855) 863-8283. A community located within Mantua Township, Sewell, NJ., has 15,217 residents, 14.3 percent of whom are 65 and older. Activities for seniors living in Sewell include walks in Washington Lake Park, taking in plays and concerts at The Broadway Theatre in nearby Pitman and trips to Heritage Vineyards. There are 14 assisted living facilities in the Sewell area — four in Sewell and 10 more in nearby communities. 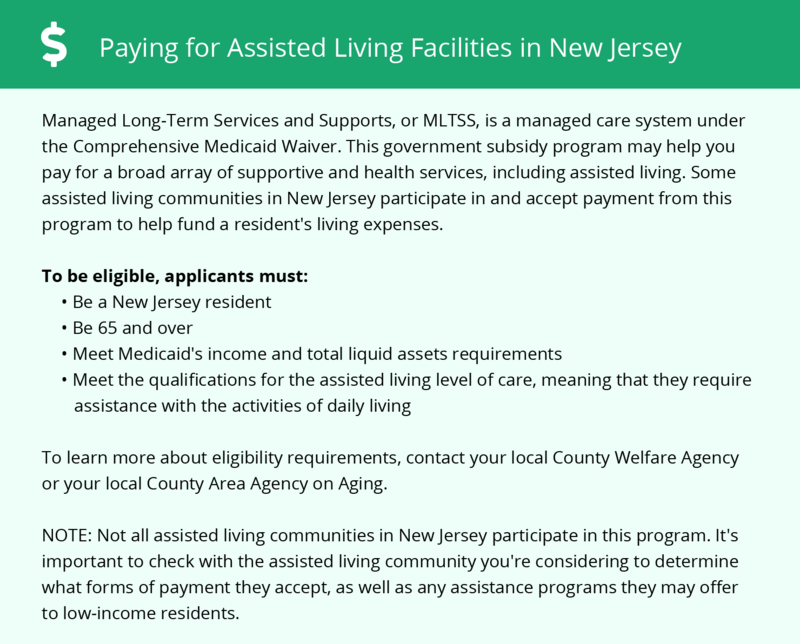 In Sewell and throughout the state of New Jersey, there are three types of assisted living facilities (ALFs). These are assisted living residences (ALRs), comprehensive personal care homes (CPCHs) and assisted living programs (ALPs). All are regulated by the Department of Health and Senior Services. Sewell's weather includes plenty of precipitation, averaging 46 inches of rain and 18 inches of snow per year, compared with U.S. averages of 39 inches of rain and 26 inches of snow. Summer highs in July average 87 degrees, while winter lows in January average 25 degrees. Seniors who enjoy the changing seasons may like living in Sewell. On a scale of 1 to 100 (100 is best), air quality in Sewell (zip 08080) scores a 61, slightly better than the U.S. average of 58. This figure is based on the EPA's National Air Toxics Assessment, which models risks for respiratory illnesses and cancers at the zip code level. Sewell's cost of living index is 116.6, higher than the U.S. average of 100, but lower than the New Jersey average of 127. The main cost factor in Sewell is higher housing costs, which could impact assisted living monthly fees. Social Security is not taxed in New Jersey, and state income taxes are low for retirees with income of $65,000 or less from retirement accounts and pensions. Yet property taxes in New Jersey are the highest in the U.S.
Crime in Sewell is low compared with U.S. averages. On a scale of 1 (lowest) to 100 (highest), Sewell rates a 22.9 for violent crime and an 18.6 for property crime, compared to U.S. averages of 31.1 and 38.1, respectively. The Sewell area is home to world-class medical facilities, including Kennedy University Hospital, in the event of medical emergencies or illness. Assisted Living costs in Sewell start around $3,940 per month on average, while the nationwide average cost of assisted living is $4,000 per month, according to the latest figures from Genworth’s Cost of Care Survey. It’s important to note that assisted living rates in Sewell and the surrounding suburbs can vary widely based on factors such as location, the level of care needed, apartment size and the types of amenities offered at each community. 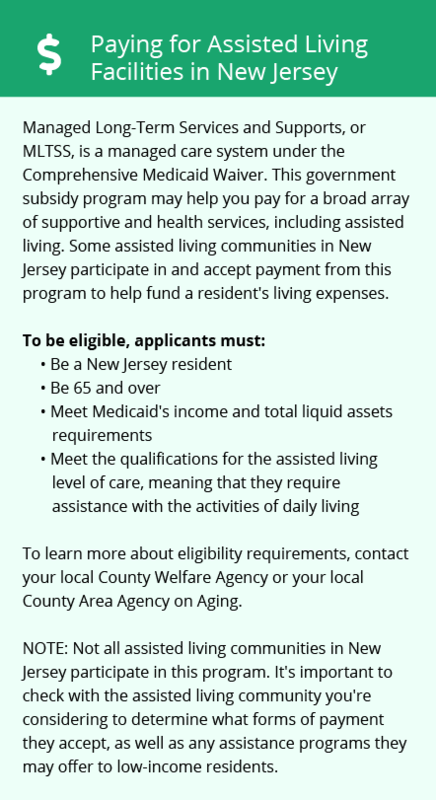 Seniors can seek financial assistance for assisted living facilities in Sewell and the rest of New Jersey via the state’s Medicaid program. The New Jersey waiver program is known as the 1115 Demonstration Waiver program. Assisted living facilities in NJ must set aside 10 percent of their beds for Medicaid recipients. Family members may supplement the program to upgrade a resident to a private room. Sewell and the surrounding area are home to numerous government agencies and non-profit organizations offering help for seniors searching for or currently residing in an assisted living community. These organizations can also provide assistance in a number of other eldercare services such as geriatric care management, elder law advice, estate planning, finding home care and health and wellness programs. To see a list of free assisted living resources in Sewell, please visit our Assisted Living in New Jersey page. Sewell-area assisted living communities must adhere to the comprehensive set of state laws and regulations that all assisted living communities in New Jersey are required to follow. Visit our Assisted Living in New Jersey page for more information about these laws.